How Many Calories are in Oatmeal Raisin Cookies? Oats are full of fiber, vitamins and minerals. But when you stir them up with butter, sugar, flour and eggs, those nutrient-dense oats fill up with calories. Your flavorful oat-filled treat can add way more calories to your diet than you may realize. Whether or not you include raisins in your oatmeal recipe doesn't make a big difference in the total calorie content. 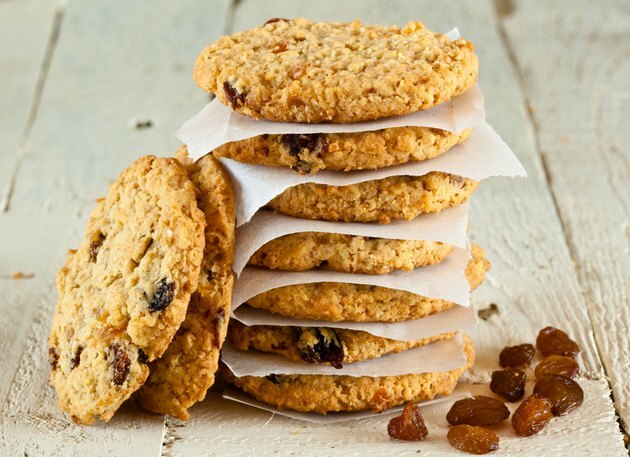 A 15-gram oatmeal cookie -- with or without raisins -- around 2.5 inches across, provides approximately 65 calories. Just four of those calories, or 6 percent, come from protein. Nearly 23 calories, which is 35 percent of the calories, are from fat. That same oatmeal raisin cookie contains about 37 calories from carbohydrates, which make up almost 60 percent of the total calories.